Ron Klauda currently serves as Director of the Monitoring and Non-tidal Assessment Division in Maryland’s Department of Natural Resources. 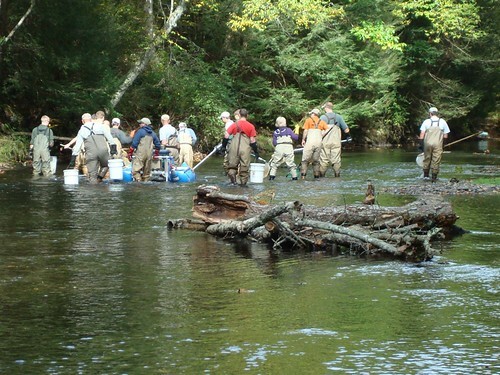 The group he supervises is responsible for monitoring the water quality and ecological health of the State’s streams, rivers, and estuaries from the mountains to the sea. Ron also serves as the Co-Chairman of DNR’s Invasive Species Matrix Team, charged with recommending management actions that DNR should take to deal with the threat of aquatic and terrestrial aquatic species. He has been with DNR for 20 years. Prior to joining DNR, Ron spent seven years as a Senior Scientist with the Aquatic Ecology Section of the Johns Hopkins University’s Applied Physics Lab. His research focused on the effects of acid deposition and other contaminants on the eggs and larvae of striped bass, American shad, blueback herring, alewife, and yellow perch. Ron is a fisheries biologist and aquatic ecologist, with a Ph.D. in Zoology from Penn State University. A Michigan native, he now lives in Prince Frederick, MD, and has seen Calvert County ‘develop’ from only two stoplights in 1981 to almost too many to count in 2010——all because of population growth: the 800 pound gorilla sitting in the back of the classroom that few people chose to acknowledge. We have a limited number of spaces left available for this important talk. Please give us a call at 410-357-9557 or drop us a line at info@backwaterangler.com to register. This entry was posted in events, news on September 30, 2010 by Theaux Le Gardeur. Thanks to Mark Noble for the nice stream report and photo from a guide trip with Backwater Angler guide Dave Smith. I’m sorry I didn’t have a chance to stop by the shop when I was done fishing today. Although it’s not too surprising, I never can tear myself away from a river until it is absolutely necessary. I really enjoyed fishing with Dave today. We did catch quite a few fish, but even better than that was fishing with someone who really knows the river and can offer tips on what you’re doing right and how to improve. I feel much more confident in my ability to create a drag free drift through cast placement and mending. I think over all we landed at least a dozen fish up to 9 or 10 inches or so. We did see some larger fish, one of which rose and bumped our caddis imitation with his nose and when it didn’t respond decided to have something else for lunch. We were hoping there would be a larger caddis hatch, but it never seemed to materialize while we were on the river. We only saw a few caddis every once in a while. 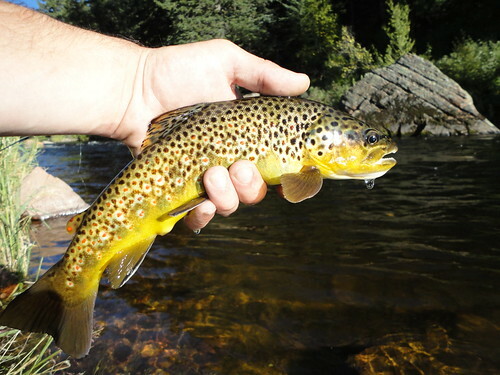 This entry was posted in fishing report, reviews on September 29, 2010 by Theaux Le Gardeur. The shocking survey scheduled at Falls Rd lot was postponed today. The river is still flowing at a steady-as-she-goes 135 CFs. Bring up some Blue Winged Olives, a rainjacket and have a natural ball! This entry was posted in fishing report on September 27, 2010 by Theaux Le Gardeur. Beware The Falls Road Beaver! Apparently there is a beaver in the upper Falls Road section of the Gunpowder terrorizing anglers and boaters. We had two reports yesterday morning of beaver attacks, and a pair of shredded Patagonia waders to prove it. The beaver actually latched onto both angler’s waders, and knocked them down. Fortunately no one was actually bitten or injured. Today we received a call from an angler who was in the shop yesterday, and he mentioned three separate incidents in the afternoon. The angler, his friend and a kayaker all had encounters with this aggressive (possibly rabid) beaver. The two anglers were charged, and chased out of the water. The beaver was rumored to have tried to climb atop a passing kayak while in motion, (I’m not making this stuff up) before being hit with a paddle numerous times. The reports all point to the section of river directly below the Highland Trail access off the upper Falls Road lot. 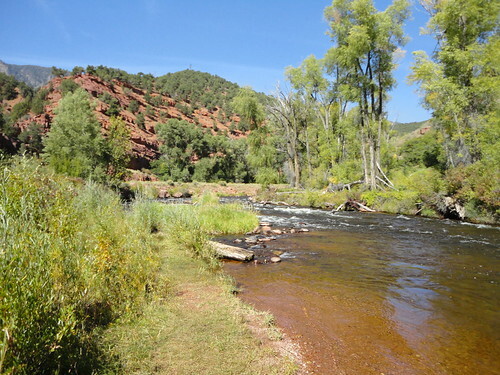 The section of river where these attacks have taken place is often referred to as the “old beaver dam pool.” It is easily recognized as the big flat just upstream of the Gorge stretch and boulder pools. 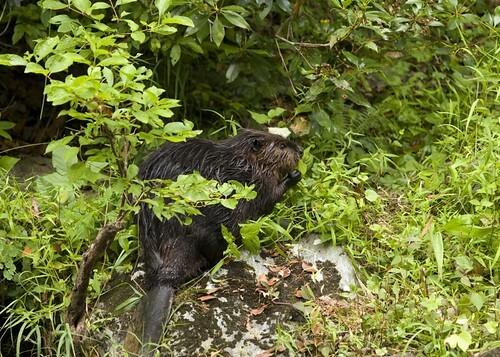 We have reported the rogue beaver to Natural Resources Police. To anyone fishing in this area, be on the lookout for a large, brown, “floating log” with a taste for Gore-tex. Seriously though, if you are in this area be on the lookout. In two days we had 5 different reports, so this isn’t an isolated incident. This entry was posted in news on September 26, 2010 by Jason du Pont. 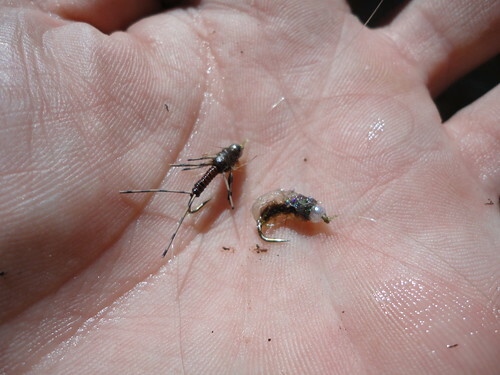 I spent my second morning on the Frying Pan River nymphing midges in shallow riffles. 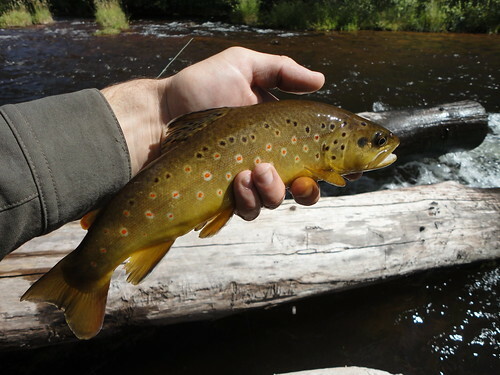 I started out on a wide riffle at a lower access point, and caught a brown on a holographic midge larva. After fishing for thirty minutes I wasn’t seeing the midge hatches I had the previous morning in the upper sections, so I moved upriver. I found a good midge hatch and rising trout that lasted for two hours. Dead drifting zebra midges, holographic midges, and black fly larvae under an indicator accounted for a dozen fish by lunch time. The majority of the browns and bows I caught were between nine and fifteen inches. Some larger brutes not willing to rise (the reason I was nymphing) would occasionally bite, and tear off across the river. Most of these trout were big rainbows, between three and six pounds, and went ballistic once hooked. The Thingamabobber would dart under, and a big bow would go airborne before I got a chance to set the hook. 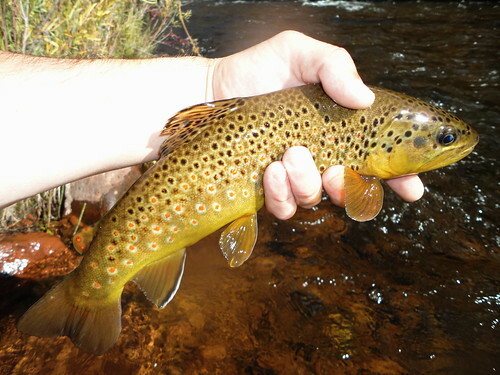 One memorable twenty inch plus brown ate the fly, and was down river in six seconds into the backing. I gave chase thinking I got through the initial run, until it swam toward an angler on the far side. To the angler’s surprise the trout swam at him in a series of jumps, leaping up, breaking me off and nearly hitting him. I think the fish actually hit his fly rod, and it definitely splashed him a little. He shot me a bit of a look, either because I was laughing, or he was trying to figure out where the fish came from. Keep in mind I was over a hundred feet above him, on the opposite side of a wide river. Once the hatch slowed, the bite did as well. I headed back into town for lunch. The midday fishing was a little more work than the morning midge action. 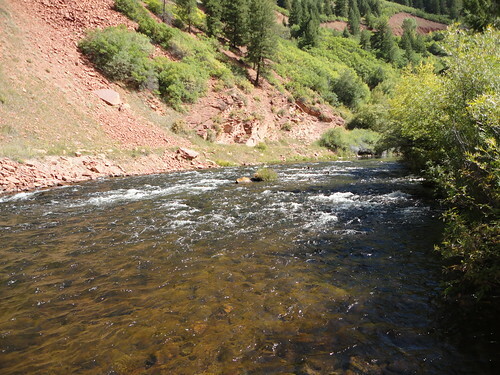 I focused on working up the river from the lower sections, covering the rougher areas where few anglers were fishing. I hit the slow edges off rough water using the rubber legged nymph and Sparkle Pupa above. One section of river had a series of riffles where the river washed up along the red rock bluffs. The bubble line hugged the ledges, and the water was just a little deeper against these bluffs. I managed to catch ten fish in one of these runs, and all of these spots looked like they held three times that many fish. Instead of changing flies, I just kept moving, trying to see what was around the next bend. The Frying Pan would change dramatically from narrow, swift chutes to wide sections of shallow broken water, and even some deep slough type sections. I gravitated to the faster sections where the trout were in predictable holding lies, and aggressively feeding. Before dark I pulled out my Scott G2 for some dry fly fishing when the midge clouds and drake spinners hit the water. The trout were focused on the size 22-24 midges, and could have cared less about the size 10 drake spinners on the water. I ended the day with a few more fish in the net before heading back into town. In the latest video post I filmed more fishing on the Frying Pan River. This entry was posted in fishing report, video on September 25, 2010 by Jason du Pont. Meet 9:30 am at the upper lot on Falls Rd. · Meet 9:30 am at the Bluemount Rd. lots and carpool down the NCR trail to the station. Contact us at the office: 410-442-2080 & 301-854-6060 or cell 240-344-7352 if you have questions about the survey or the schedule. We will try to keep the schedule as firm. High flows and heavy rain will require us to reschedule. Please respond if you are going to help so we can plan accordingly. This entry was posted in news on September 24, 2010 by Theaux Le Gardeur. The Gunpowder is flowing at 156 CFs, is 52F and clear. This week I’ve been looking skyward as the autumnal equinox, the alignment of Jupiter and Uranus, and a looming harvest moon signals an official end to summer. Excellent flows this week have allowed folks that have very little water left in Northern Virgina and South Central PA to give the Gunpowder a try. 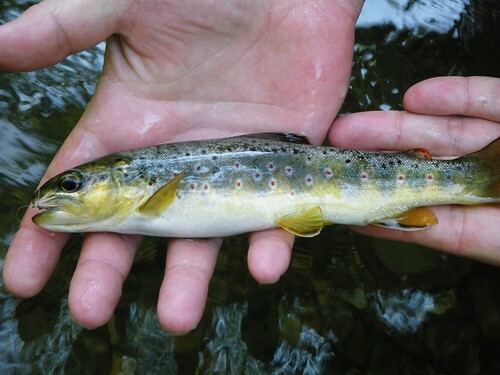 If you’re fishing dries, Caddis, Olives and Tricos are still in the mix. Small Copper Johns with a caddis larva droppers are also accounting for quite a few fish in the riffles. The water will be dropping by Monday for the DNR annual shocking survey, so enjoy the flows and the fishing this weekend. I’m sorry, I forgot your name. I was in the shop earlier today (Saturday). I am the PhD student from University of Maryland. I just wanted to say thanks for the info and the advice you gave me. My friend and I had a great day and caught a bunch of fish. We tried swinging the caddis emergers briefly but it’s just not what I’m used too. I think I gave up on that a little too quickly. Anyway, we wound up fishing the bead-head emergers under a fairly good size elk hair caddis. That seemed to do the trick. We were catching fish of all sizes in some surprisingly shallow water just like you said we would. All the fish came on the emergers. I was amazed at the density of fish in the Gunpowder. Again, not what I’m used too. We will definetely be back to the Gunpowder and your shop. Just wanted to drop a line and say thanks for the help last weekend. My buddy and I were the ones in early Saturday morning to pick up flies and get a report on the river. Learning a new body of water is always a process, and we would have been lost without the help. You’ve got a great river up there, and I hope to make it back soon for a fishing trip and hopefully a clinic or two as well. Always looking for chances to pick up new skills. This entry was posted in fishing report on September 24, 2010 by Theaux Le Gardeur. Baltimore Harborkeeper Trash Bash is Tomorrow! Want to do something to protect the water in the harbor? Please join Baltimore Harbor Waterkeeper, Eliza Smith Steinmeier on September 18, from 12:00- 5:00 PM at Nick’s Fish House overlooking Middle Branch for a silent auction fundraiser including a seafood buffet, oyster bar and live music. Backwater Angler has donated a full day guided fly fishing trip on the Gunpowder River for the event and encourage all to attend. The Mission of the Baltimore Harbor Waterkeeper is to protect and restore the Baltimore Harbor and the greater Patapsco River & its tributaries through enforcement, fieldwork and citizen action in order to make the river suitable for recreation including fishing and swimming, to improve public health, and improve the health of the river ecosystem. Buy tickets online or make a donation to the Baltimore Harbor Waterkeeper. This entry was posted in news on September 17, 2010 by Theaux Le Gardeur.